Don't forget to enter the fabulous Banshee Giveaway of Rachel Vincent's My Soul To Save here (three copies to be had). Rachel has also posted a partial list of other blog tour sites with chance to win copies. 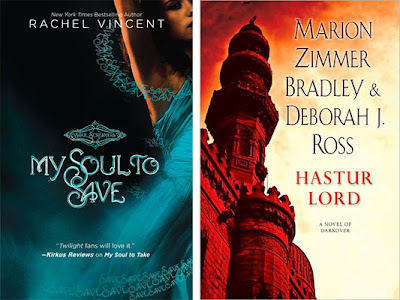 Fans of Marion Zimmer Bradley's Darkover fantasy series have an opportunity to win a copy of the latest installment Hastur Lord. I have four copies to giveaway! 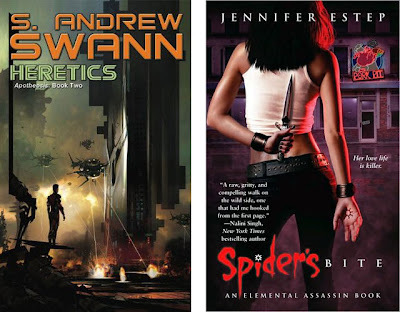 February 2 - Science fiction and urban fantasy author S. Andrew Swann will be visiting to talk about Heretics the second book in his Apotheosis space opera trilogy. He will also be back for an interview when Wolf's Cross launches in late July. February 5 - Jennifer Estep will be here to talk about her new Elemental Assassins series which launches with Spider's Bite in January, quickly followed by Web of Lies later in February. New to the Events schedule for the following week is the lovely Jeaniene Frost who is going to be here February for the launch of First Drop of Crimson, the first book in her new Night Huntress world spinoff series. Remember to check my Author Events and Interviews schedule posted on my left sidebar for the most recent updates. 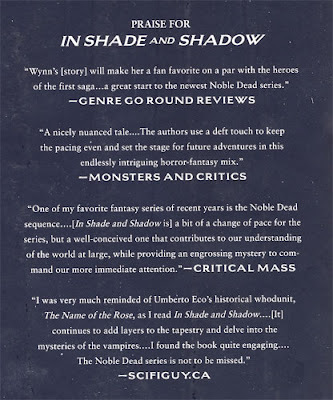 On a more personal note I was thrilled when I saw the book jacket for Through Stone and Sea (Book 2 in the second Noble Dead series) by Barb and J.C. Hendee because SciFiGuy.ca received a blurb credit! I was equally surprised last month when I read Betrayals by Lilith Saintcrow and discovered a blurb inside for my review of Strange Angels. Sweet. Kelley Armstrong says that her publisher HarperCollins has posted The Summoning as a free read here. She is also running a contest. Details here. Closes Monday. Lilith Saintcrow announces that she has an excerpt of her short story Best Friends from the forthcoming The Girl’s Guide To Guns & Monsters anthology over at FlamesRising as well as a preview of her essay for the soon to be released Ardeur: 14 Writers on the Anita Blake, Vampire Hunter series. The essay is titled Ambiguous Anita. Rob Thurman has posted an excerpt from Roadkill the next Cal Leandros novel releasing March 2. Excerpt from The Mage in Black by Jaye Wells. I have long been a fan of the Lynsay Sands Argeneault Vampires series. In Lynsay's most recent newsletter she reveals the dates and details of the next two books in the series - Born to Bite and Hungry for You. August 31, 2010: Born To Bite, the thirteenth book in the Argeneau/Rogue Hunter series, will be coming out this September. Armand Argeneau has been living on a farm squirrelled away from public life for decades without anyone bothering him. Until now that is. Lucian has been kind enough to volunteer Armand to babysit Eshe d'Aureus in order to protect her from a rogue vampire out for revenge. In reality, Eshe was sent to Armand on assignment to find clues to explain his many wives' 'accidental' deaths. This installment of the Argeneau/Rogue Hunter series will also answer the unanswered questions from Nicholas's story, The Renegade Hunter. November 30, 2010: Hungry For You, the fourteenth book in the Argeneau/Rogue Hunter series will be coming out this December. It involves the last of the Willan sisters, Alex, and one of Martine Argeneau's older sons, Cale. Alex is a successful chef and restauranteur trying to expand her business and the new location's debut seems to be riddled with bad luck. Can Cale, a successful european chef . . . er . . . businessman, help her keep her business afloat and still keep her frazzled attention long enough to see him for who he really is . . . the love of her life? Author Alyssa Day announced that she is moving to Japan for 3 years! What an experience that will be. Read her blog posting about the decision here. Leanna Renee Hieber announced that her publisher has picked up books three and four in her Strangely Beautiful series. Congratulations Leanna! Michelle Rowen posts about book titles and how rarely the published title matches the initial working title. The 2010 Nebula Awards for the year’s best literary and dramatic works of speculative fiction will be held Thursday, May 13 through Sunday, May 16 in Cocoa Beach, Florida, on Cape Canaveral.Full details on the SFWA website. Jordan Summers alerted me on her blog that there will be a Blood Lite 2 anthology. Jordan's story - "Tastes Like Chicken" will appear. Editor and SF author Kevin J. Anderson on his blog says of the anthology - "I have finished reading all the submissions and selected the final entries. 100,000 words of new fiction from big names and little-known names. I think this volume is even funnier than the first. I still have a bunch of paperwork to do, writing up contracts for all the authors, compiling bios, etc. But this book is ready to roll. 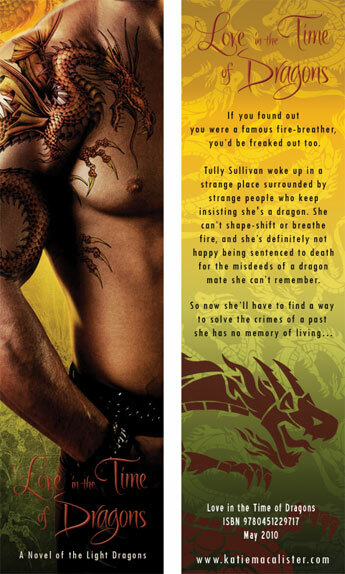 Katie MacAlister showed of the promotional bookmark for her forthcoming Love in the Time of Dragons. Sweet! Author Melissa Francis has joined Nancy Holzner, Sean Cummings, Rita Vetere and company at the Good Girls - Bad Juju blog.Rita also reports that Monday, February 1 at 8:00 p.m. ET, she’ll be joined by fellow GoodGirl, Nancy Holzner, and the BadJuju himself, Sean Cummings, for a live chat at Chatting in the Dark with giveaways including a signed copy of Nancy’s kickass urban fantasy novel Deadtown and a signed copy of Rita's latest dark fantasy release Born of Darkness. SF Signal has the complete table of contents of the forthcoming werewolf anthology, Running with the Pack, edited by Ekaterina Sedia which inlcudes urban fantasy familiars Carrie Vaughn, C.E. 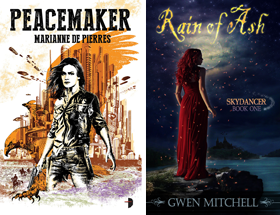 Murphy, Laura Anne Gilman and a host of terrific SFF authors. Book Trailer for Frost Moon by Anthony Francis. Cover and excerpt featured in my January 9 UF Weekend Report. Julie Kenner's alter ego pen name J.K. Beck's website is live. Check it out. The Lovecraftian Steampunk YA Faerie Adventure novel formerly know as The Witch’s Alphabet has a brand new shiny sparkling-like-a-vampire-in-Miami title! That title is The Iron Thorn. The new title came together as a mashup of two other titles, one suggested by me and one by Editor Krista at Delacorte. Collaborative in the truest sense. Honestly, I love it. I loved Witch’s Alphabet too, but this is a fantastic title and it’s honestly more evocative of what the book is about as a whole, rather than a single plot element. Because this book is, after all, a Lovecraftian Steampunk YA Adventure. With bonus! evil faeries and sinister conspiracies, dirigibles and forbidding mansions and fantastical machines. Kelley Armstrong is having a contest to win copies of her limited edition novella Angelic. Details here. In the good news category according to SciFi Wire the BBC urban fantasy series Being Human which is currently in the midst of its' second season has been renewed by the network for a third season. Yeah! Jason Henninger at Tor reviews The Imaginarium of Doctor Parnassus. Carrie Vaughn on Legion. Nicole Peeler on Doctor Who. 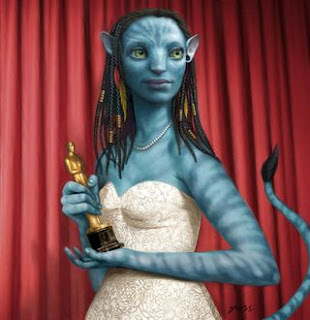 John Scalzi points out this article at the LA Times about SF and the Oscars. I just like the picture.Very funny and quite likely. Are the Leaguers not amazing for offering up these prizes? There’s a total of 35 novels being given away to 7 different winners who will get to pick 5 novels to take home. It’ll be a first come first choose and the Leaguers want to give everyone has many chances to win as they can. So in addition to each review posted for the challenge (again, up to 5), if you post your review in another place (i.e. GoodReads, LibraryThing, Amazon, etc) and then leave a link in the comments, you’ll get another entry for a chance of 2 per review. So if you want a chance at any of these, then go over to the New Author Mini Challenge page, sign up and start getting your books ready for February 1st. Any League book you read and review during February counts, with a ceiling of five reviews per person – and you don’t have to be a blogger to participate. Just make sure you get a review somewhere – on Amazon, GoodReads, LibraryThing…hell, you can be a guest reviewer here if you want to be (email me if you’re interested in this option myjaxon at gmail). The goal is to not only try (and end up loving) one of these fabulous authors, but to give them a little pimpage as well. 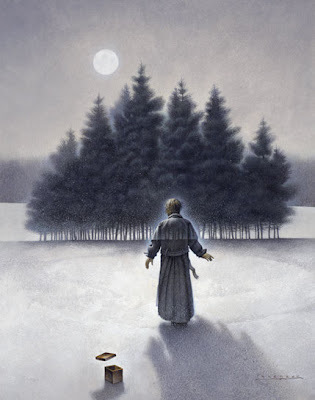 Irene Gallo at Tor announced that John Jude Palencar has won this year’s Society of Illustrators’ Hamilton King Award for his artwork on Charles de Lint’s Muse and Reverie. Alyson Noell revealed two new covers this week. 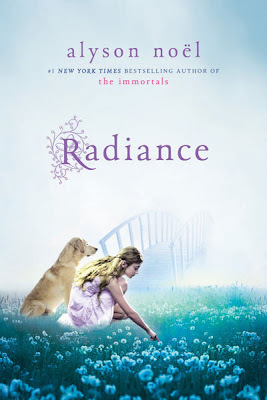 I posted the cover for Dark Flame earlier and now we have Radiance, Book 1 in The Immortals young adult spin-off series. Radiance releases August 31. From the #1 New York Times bestselling author of the Immortals comes a new middle-grade series featuring Ever’s younger sister, Riley. Riley Bloom left her sister, Ever, in the world of the living and crossed the bridge into the afterlife—a place called Here, where time is always Now. Riley and her dog, Buttercup, have been reunited with her parents and are just settling into a nice, relaxing death when she’s summoned before The Council. They let her in on a secret—the afterlife isn’t just an eternity of leisure; Riley has to work. She’s been assigned a job, Soul Catcher, and a teacher, Bodhi, a curious boy she can’t quite figure out. Laura Anne Gilman posted the cover for her paranormal romance The Hunted (written under pen name Anna Leonard)about a selkie. Coming April 1. 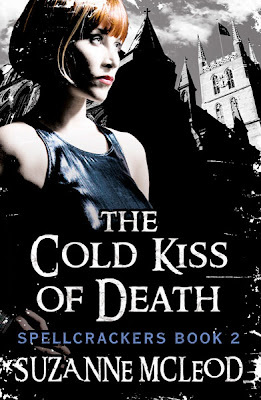 Suzanne McLeod posted the UK cover for her second Spellcrackers book, The Cold Kiss of Death. 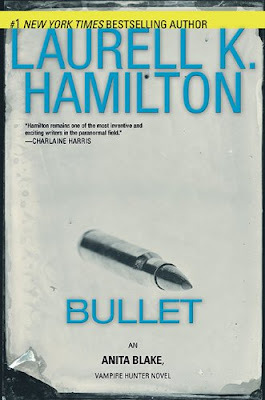 Tez Says reveals the cover for Bullet, Laurell K. Hamilton's newest Anita Blake adventure. I hear the name of the book and always think Steve McQueen. Unfortunately the cover design leaves me cold as do most of the new US covers for the Anita books. 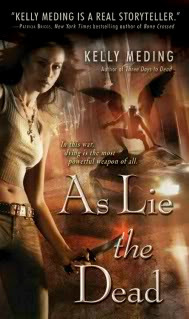 Kelly Meding revealed the cover to As Lie the Dead thise week. It is the second Dreg City novel. Mario Acevedo on the Biting Edge blog points us to this video. Mario says - "In case you wanted to look like an revenant bloodsucker but didn't know how, watch this video of makeup and fashion tips. But for an authentic bloodshot-eyes look, my vampires recommend cheap whisky." John at Grasping for the Wind has one of his wonderful Inside the Blogosphere posts where a wide range of bloggers answer the question Who Introduced You to the Love of Literature? Abigail at All Things Urban Fantasy is introducing a "Hot Off the Press" feature showcasing monthly releases. Check out her February release list. This comment and image from OCD, Vampires, and Rants, oh my! 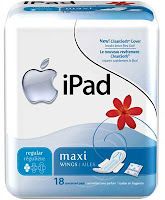 sums up yet another feeble attempt by the technology industry to market and deliver a decent eBook device. Boy, I just can't wait to get my hands on a device whose name brings mental associations of pain, mess, inconvenience and bulk. Awesome. If you are looking for some good fantasy books with romance themes check out this post from Amy at Romance Book Worm. I've read a little over half of the suggestions on her list (the Anne Bishop, LOis McMaster Bujold and ELizabeth Vaughn series are favourites). Excellent suggestions. I am introducing a new feature to the Weekend Report. Each week I am going to select some weird or wonderful item from my SFF collection and profile it here. This week I am launching with The Golden Amazon's Triumph, a paperback from an imprint we are all familiar with - Harlequin. 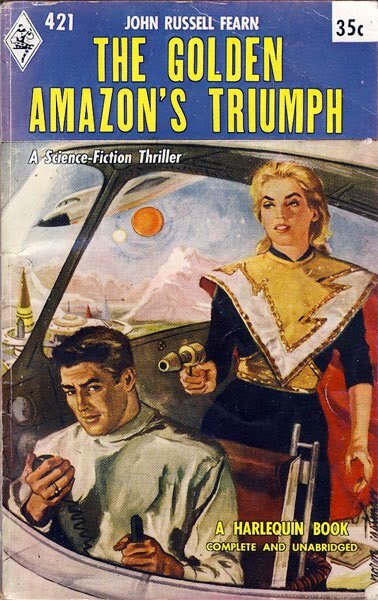 Here is a science fiction title (yes Harlequin did SF, I have an Edgar Rice Burroughs title too) from 1958. 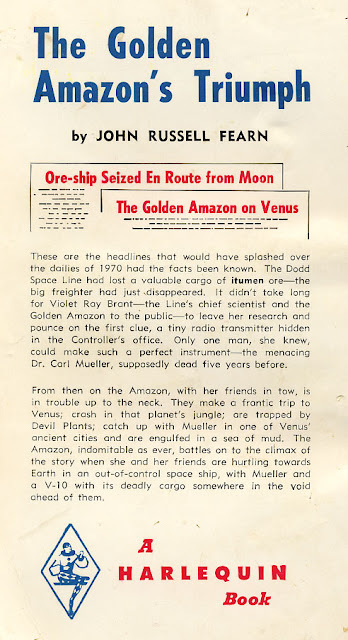 John Russell Fearn was a prolific UK author and his Golden Amazon series was hugely popular here in Canada in the late 50's and early 60's in newspaper literary supplmements. Linda Robertson at the Hallowed Circle release party. Thanks for the links and congrats on the blurb credit. How cool is that? Congrats on the blurb credits! That's really something! I noticed that The Golden Amazon's Triumph cost 35 cents back then. That just amazes me. I really can't remember a time that books were that cheap. 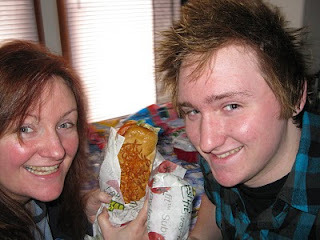 Hey Doug, thanks for the link up and for the great finds around the blogosphere. Great report as usual. About Amazon and Macmillan's dispute - the way I heard it was that Macmillan asked Amazon to raise all their prices on e-books to match the prices on the i-pad and Amazon refused. So actually Amazon were looking out for their customers and refusing to charge them more. Let's hope Macmillan backs down! Abigail it was pretty exciting when Barb Hendee first told me that Tor was considering using a blurb from my review. I wonder how may minutes of my 15 that uses up? Thanks Donna. I have some 25 centers too. Comics cost a dime then and you could go to a movie for a quarter. Thanks Chris. For an SF booklover a store like Uncle Hugo's is positively orgasmic. S I hear you but disagree. These things can be negotiated without withdrawing services from the consumer. Bottom line is customers cannot buy Macmillan books. Amazon and Macmillan's dispute should NOT spill over and catch the customer in the middle. Congrats on the mentions! It's always awesome to see those, isn't it? Now that I have time to actually look through your report, and no skim it, thanks for mention the League challenge! I wasn't expecting it to take off like it did, but I'm glad. Jackie it is always a thrill especially when it catches you by surprise. As for the League Challenge that is a fab event and should be supported by the community as best as possible. You could almost say that collection of authors is the core of UF. I'm currently going through the original Noble Dead series and really enjoying myself. Very cool to hear about the blurb credits. Big Congrats! !